Michael Flatley's exciting new dance extravaganza Lord of the Dance: Dangerous Games hot foots into Melbourne this September, and you are invited along for the theatrical adventure. Michael Flatley's new show heads to Antipodean shores after a sell-out season in London's West End and extensive tour of British. The dance spectacular arrives in Australia as part of a global tour, visiting 15 countries around the world. Irish dancing remained relatively unknown as far as dance genres go, until Michael Flatley threw the Emerald Isle's traditional jig into the global spotlight 21 years ago with Riverdance, adding a modern and rather spectacular new spin on an otherwise classical set of dance steps. The American star of stepdance went on to create Lord of the Dance; one of the world's most successful on-stage dance performances. Lord of the Dance: Dangerous Games will open in Hobart on 10 September, moving onto Perth, Adelaide before opening in Melbourne on 29 September at the Arts Centre. After Melbourne, the touring show moves to Canberra, Brisbane, Gold Coast and Sydney. Flatley's new production is far from your average dance show, this time featuring mesmerizing effects using groundbreaking technology, fabulous new choreography and stunning costume designs. Expect to see holographs, dancing robots, world class acrobatics, and no less than 34 of the best Irish Dancers in the world. 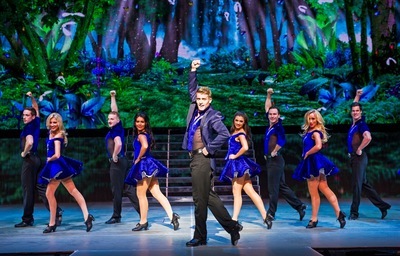 Coupled with all the visual and musical wonder, Lord of the Dance: Dangerous Games tells the tale of good vs evil in a story that follows old Irish folklore, conveyed through dance. In an exclusive KidTown Melbourne promotion, we are giving two subscribers the opportunity to win a double pass for the opening night of Lord of the Dance: Dangerous Games in Melbourne on Tuesday 29 September, 7pm performance at the Arts Centre, valued at $89.90/ticket, therefore $179.80/double pass. To enter, we ask that you email kidtownmelbourne@gmail.com with your full name, and LORD OF THE DANCE in the email title. The winner will be notified on Saturday 29 August 2015.